The Planar® Profile™ Mounting System facilitates an ultra thin profile when paired with Planar® UltraRes™ Series displays. The mounting system incorporates a kick-stand design that tilts the display away from the wall for easy access to electronics on the back. This feature eliminates the need to completely remove the display from the wall when accessing inputs or servicing the display. 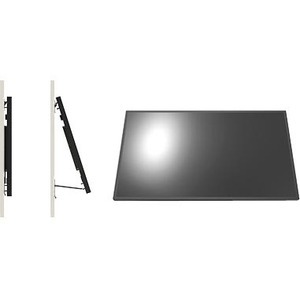 With the Planar Profile Mounting System, most Planar UltraRes Series and Planar UltraLux Series displays are thin enough to meet rigorous Americans with Disabilities Act (ADA) accessibility guidelines in buildings and facilities, requiring mounted depth to be less than 4" from the wall. The mounting system is also lockable for added security and is available in both landscape and portrait options.